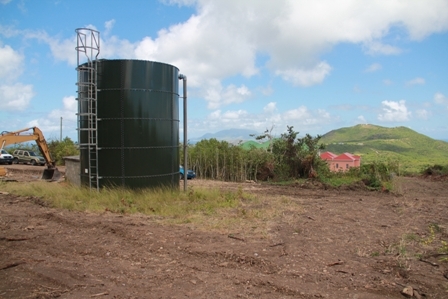 CHARLESTOWN NEVIS (JULY 13, 2012) — Phase I of the EC$30million Nevis Water Enhancement Project commenced in Spring Hill on Friday July 6th, 2012 with preparatory work for the construction of a 500,000gallon reservoir. 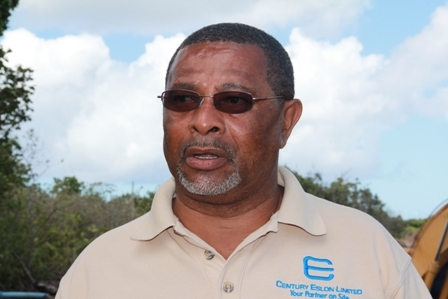 It will be the first of four reservoirs along with two pumping stations to be constructed under the Caribbean Development Bank (CDB) funded project. 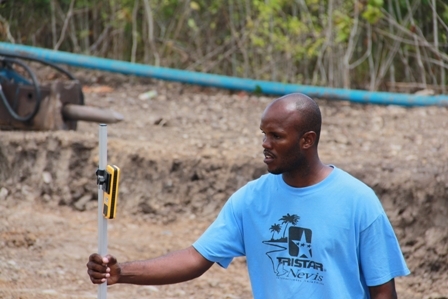 Project Manager Mr. George Morris told the Department of Information on July 9th, that the site was one of six being prepared ahead of actual construction work which was schedule to commence in November. The entire project is slated for completion in 2013. “We are here at Spring Hill a site for one of the six reservoirs that will be built under the project. The other sites would be Camps, Maddens, Fothergills, Stoney Hill and Morgan Estate. “We are preparing the site for the reservoir, which is going to be of glass fuse [steel] similar to the one that is presently on the site here. It will be a 500,000gallon reservoir with all the amenities that goes with it… The entire project is due to finish by the end of 2013. We have to prepare eight sites, six sites for reservoirs and two sites for two major pumping stations one at Camps and one at Fothergills,” he said. According to Mr. Morris, another area in close proximity to the Spring Hill site was cleared to lay access pipes to and from the reservoir. “There are other areas in close proximity which is cleared and that is for the pipelines coming into the reservoir and going out of the reservoir. This reservoir would get its water from Camps Spring which is located down at Camps [Village] and it would be a distribution for Fountain, Westbury, Jessups, Cotton Ground and as far as Charlestown,” he said. Regarding capacity he said the existing reservoir nearby was capable of carrying 20,000 gallons of water and was built out of the same material in which the new reservoir will be constructed. The new reservoir will carry 500,000 gallons and stand at a height of 50 feet, thirty feet more than the existing reservoir. 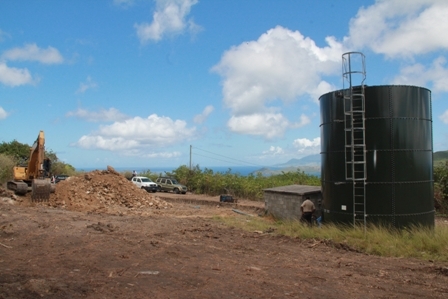 The Project Manager further explained that when at its maximum capacity, it was expected that the new reservoir would store water that would provide a three and a half day water supply to the areas of Fountain, Westbury and as far as Cliff Dwellers, Jessups and Four Seasons. Mr. Morris also noted that the project’s engineering consultants Halcrow would be on Nevis by the end of July, to finalise bid documents which would go to tender shortly after. However, he noted that the preparatory work for the reservoirs had commenced ahead to ensure that work would begin as soon as the material had arrived on island. He also gave further insight into the project and contractual arrangements. “The reservoirs will be a turn key project where whoever wins the contract will come and build the reservoir and hand over to the Water Department. The Water Department will connect to the cistern. “In this project we will also see a 10inch main coming from the Maddens reservoir to the Camps reservoir then up to Spring Hill here. The distribution line will be an 8inch pipe from here going towards Fountain unto Westbury up to as far as Cliff Dwellers and that would complete the distribution from this reservoir. Other distribution will be out of Stoney Hill and out of Morning Star and in the Rawlins are,” he explained. The advanced work is being undertaken with the assistance of engineers from the Public Works Department.